I heard this song on the radio while driving home from a gig last month, and since then I sometimes find myself absent-mindedly humming the melody. This entry was posted in Uncategorized and tagged jazz, Jeff Holmes, lead sheet, Macaroons, music, Noteheads, transcription on October 18, 2017 by noteheads. Lately I’ve been listening to Jack McDuff’s Moon Rappin’ album while driving around. It’s fun and funky, thanks in no small part to the spirited drumming of Joe Dukes. This tune finds Joe taking a long, energetic solo while keeping the groove locked tight. This entry was posted in Uncategorized and tagged Jack McDuff, jazz, lead sheet, Made in Sweden, music, Noteheads, transcription on October 8, 2017 by noteheads. Here’s a Tadd Dameron tune written over the changes to “Out of Nowhere”, one of only a few of these contrafacts I know (the others being Fats Navarro’s “Nostalgia”, Ornette Coleman’s “Jayne”, and Lennie Tristano’s “317 East 32nd Street”). Can you think of others based on this chord progression? 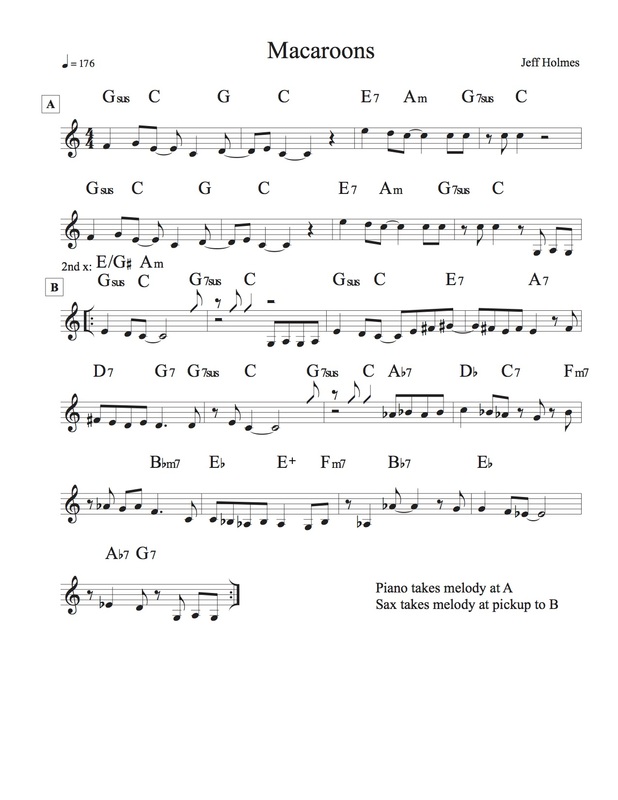 This entry was posted in Uncategorized and tagged Casbah, jazz, lead sheet, music, Noteheads, Tadd Dameron, transcription on October 1, 2017 by noteheads.